Summary Dual-band 802.11n Ethernet bridge with built-in four port 10/100 switch. Despite Cisco's paring down of its consumer networking product line, it apparently still recognizes the need for wireless bridges. The WET610N, which I reviewed back in 2009, has long been its go-to bridge. 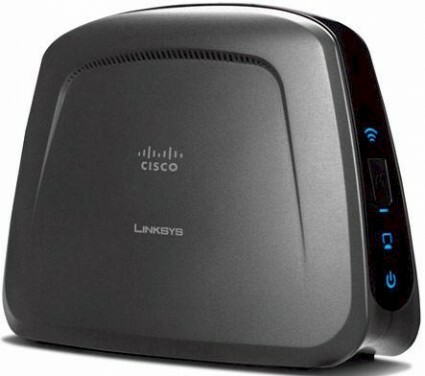 And new Cisco has added the WES610N for folks who like more than one port in their wireless bridges. Cisco must have been in a quandry for naming its new beastie. The "610" harkens back to the days of the old top-of-line WRT610N. But with the current top-of-line being the E4200, you have to wonder why they didn't dub this the WES4000N. At any rate, the WES610N is very much like its single-port sibling. So much so, that there is one user manual for both products, where I took the front and rear panel callout views in Figures 1 and 2 from. Both products come in simiilarly-sized plastic cases that are larger than you might expect. The WES is about as big as some four port routers that I've seen with dimensions around 7 x 5 x 2.5 inches. The vertical design has the three antennas spread across the arched top of the bridge. All ports are 10/100, not Gigabit. I did a detailed internal look at the WET610N and the WES hews closely to that design. Both use a Metalink WLANPlus chipset comprised of a MtW8171 2x3 802.11n MAC/BB and MtW8151 2x3 2.4/5GHz 802.11n RFIC. (Figure 3). The chipset uses Forward Error Correction technololgy to allegedly optimize streaming video performance. Since Cavium purchased Star Semiconductor, the WES610N CPU is a Cavium Econa CNS1101M-250 instead of the Star STR9101 SoC in the WET610N. The amount of flash has been reduced from 8 to 4 MB, but the RAM stays the same at 32 MB. The WES610N's switch is a Realtek RTL8305 5 port 10/100 switch. I've included the WET610N's FCC board shot for reference in Figure 5. Note the different antenna design, which could play a part in the difference in performance between the WES and WET we'll see later. One of my criticisms of the WET610N was its dogged adherence to the old run-the-CD-first installation method. The WES is a bit more schizophrenic in its installation instructions. Cisco nicely provides a little holder with a CD tucked into a right-side pocket with Run This CD First in bold print designed to catch your eye. But the left side lays out a four step process using Wi-Fi Protected Setup (WPS). So which is it, Cisco? Being the old-school guy I am, I seldom run installation CDs. But I was curious to see what this one held. The first clue came in the CD's title: Documentation Resources. Popping the CD into my desktop's CD didn't auto launch anything. I had to open the CD to see the contents shown in Figure 6, with nary an install wizard in sight. So it appears that the best course of action is to use WPS. Unless you have a real oldie, your router should support WPS with both pushbutton and PIN entry methods. The NETGEAR WNDR3700 (original) I used to test the WES with supports both methods, so I tried a pushbutton session. The session took about 30 seconds and ended up with a WPA2 AES secured connection. When you use WPS on a dual-band router that supports WPS on both bands (as the WNDR3700 does), you don't get a choice of band unless the router lets you control WPS on a per-band basis (the WNDR3700 doesn't). On two runs, the WES610N connected to the WNDR3700's 5 GHz radio both times. If you want to set the bridge up manually, your best bet is to plug a computer into the WES via Ethernet and set it to obtain its IP address information automatically (as a DHCP client). Since there is no DCHP server in the WES, your computer will set itself to a link-local address (169.254.X.X with 255.255.0.0 subnet mask). The WES itself will default to 169.254.1.250 as described in a the handy Troubleshooting Guide.pdf file included on the CD. You just enter that IP into your browser, log in (admin / admin) and enter the wireless settings to match your network's. While you're in there, nail that puppy down with a static IP address outside your router's DHCP server range so that you don't have to go hunting around for it. If you set up manually and have the WES set to obtain its IP address info via DHCP, it will grab an IP from your WLAN's router, so you'll lose contact with it. I found that the WES usually grabbed an IP address one lower than that grabbed by the computer plugged into it.